The decision to homeschool is often a joyful one for Black homeschoolers. Families are ecstatic because they’re now able to provide a personalized and cultural based education to their children from the comfort of home. But as happy as parents may be about the decision to homeschool, they may be surprised to find that not all relatives share the joy. Why do some homeschool families face criticism from their loved ones? Much of the disdain is rooted in a lack of knowledge regarding homeschooling. Some family members believe homeschooling is illegal. Some relatives think parents need to have a degree in education in order to homeschool, while others worry the homeschool children they love will no longer have opportunities to socialize. What is the best way to approach the homeschool naysayers you love? Some will say it’s simply best to tell them to mind their own business. You are certainly free to do that, but there are alternate methods of dealing with criticism that may be equally effective. 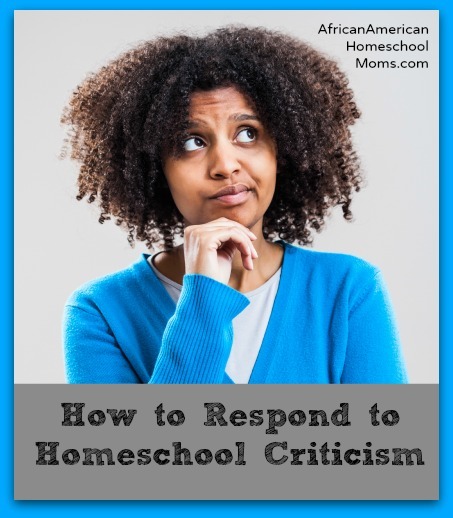 Here are four tips you may wish to consider using when facing homeschool criticism from relatives. Make sure everyone is on the same page. If Aunt Jessie questions you about the decision to homeschool and then poses the question to your husband, she should get the same response from him. Relatives should not be able to pit your response against the response of your spouse. Your homeschool should be a unified team effort and your response to critics should reflect that. Give planned responses. Make a list of the potential criticisms and create a planned response for each one. Planned responses accomplish four things. First, they serve as a way to make sure you and your spouse are providing the same response to critical relatives. Next, planned responses prevent you from scrambling to create a response based on something you pull off the top of your head. In addition, planned responses can prevent emotions from flaring up because you’re not offering a response based on anger, fear, or annoyance. Finally, planned responses prevent you from being drawn into a never-ending homeschool debate. Explain your decision to homeschool is not up for debate. If you are not interested in engaging in any discussion about your decision to homeschool, make this known immediately. Offer a simple set of statements such as, “We are the parents and our decision to homeschool is based on our love for <insert name(s) here> and our desire to do what is best for her. Our decision to homeschool is not a topic we will debate.” That clearly lets the relative know you will not engage in a back and forth homeschool debate. Recognize that questions don’t always equal criticism. Sometimes relatives have genuine questions about homeschooling but view those questions as criticism. Though some questions are asked as a way to criticize, not all questions are asked with ill intent. Some relatives may just be seeking clarity, so when faced with questions take time to answer thoroughly and honestly. Once questions are answered, relatives are likely to have a better understanding of what it means to homeschool. Answering questions may block potential criticism. When dealing with homeschool criticism, it’s good to have a well thought out response. But no matter how you choose to respond to homeschool criticism, remember it’s not your job to win over skeptical relatives. Your job is to provide a loving and high quality education to your children. Don’t let critics block your child’s path to educational success.